I have never seen this before. Thanks for the intro to a new DIY! This came out great. By the way, I have been trying to "follow" you on pinterest. When I click on your "p" button....it always says "oops"....any ideas? I hadn't seen this crayon art and I do think it came out pretty cool! Maybe just a little too much "fun" with the frame and the crayons together. That frame would look great with a mirror. The pinterest link is all fixed. Thanks for the bug catch Linda! @Mama Smith, I think you're totally right about too much "fun." Right now I'm planning to do a really simple embroidery project, but I'm going to keep the mirror idea in mind! This post is hilarious! I laughed so hard. It looks like a great idea (and I like the colors)! i tried commenting on this but then my laptop died and i forgot to come back and re-post it. i loved this post, it was hilarious! and aside from being maybe a little more colourful than you were going for it does look pretty cool still, a cool idea might be to cut that size heart out of thick cardstock and attach it "floating" over top of the other one with sticky foam or cardboard or something. if not a hair dryer what should you have used instead? a heat gun? who had a heat gun? @ katie, I like the idea of the heart floated above. I think that would look even better than if the original plan had gone as hoped. I think if I attempt this porject again, I might do black, grey, and white crayons with like one pink one or something. I'll have to muster the courage though! All of the tutorials I've seen have used hairdryers. I think the hairdryer was a problem because my crayons were so short (I cut them so they would fit in the frame) and because I used paper instead of canvas or foam core or something. And too ashamed to even think of taking a picture! hahaha! 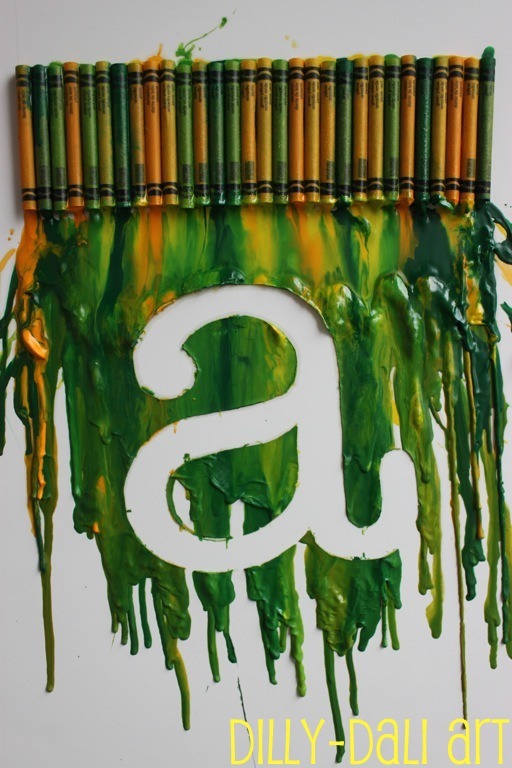 As for your crayon art. I think this art was not ment to be framed and I think it would be much pretier without it. I like the colour combo, whay don't you try to hang it in the melting direction? Your orange frame. I must admit it is not my favourite one, but I think something black and white, and simple would be a better fitting. Why don't you try a greometrical pattern? @ decoratica, blinding glitter - love it!! I'm so glad everyone is suggesting art solutions - I have a lot of thinking to do! You guys are great! I really like your color combo, but I loved the drip design in your sink! 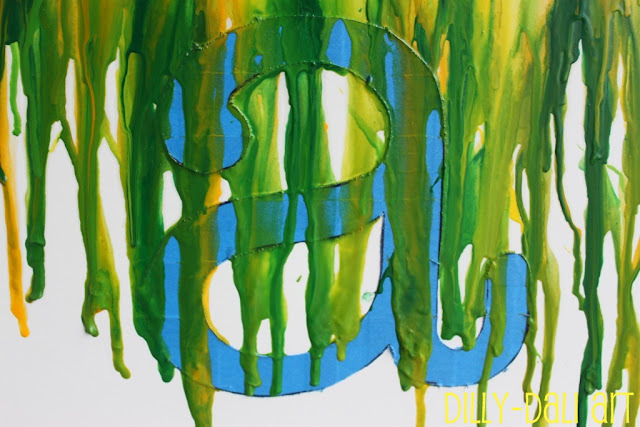 Maybe you could start a new crayon art trend of just abstract drips on the canvas. I really like the colors that you chose, they compliment that adorable frame perfectly! If you're willing to try, I think that you should be able to glue the paper to some foamcore and remelt the crayons to cover the shape you made with the tape, since you weren't pleased with it. @Aleacia, good ideas for re-working the crayon art! I ended up cleaning the sink with an SOS pad. I tried hot water, but the sink water didn't get hot enough and I didn't think to try boiling water. A little elbow grease and the SOS pad worked great! Thanks for sharing your tutorial! !